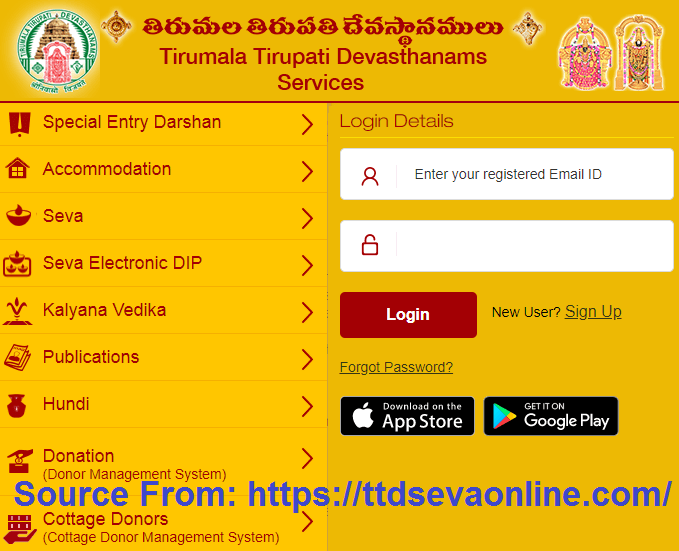 TTD Seva Online Tickets Booking, Tirumala Rooms Online Booking in ttdsevaonline.com, Seva Electronic Lucky Dip Result and Ttdsevaonline New User Login Registration…. This famous temple is located in Chittoor district of Andhra Pradesh in the town Tirumala, located at Tirupati. Have you ever heard of Seshachalam Hills range? Actually, Tirumala is a part of this famous hills range. As the name of the Seshachalam hills suggests, the hill comprises seven hill peaks which are said to represent the seven heads of Adisesha. The temple is located on the Venkatadri hill peak, which is counted as the seventh hill of the Seshachalam hills. How to Signup TTD Seva Online Login Registration in ttdsevaonline.com? How to Book Tirumala Rooms Online Booking (Accommodation) in ttdsevaonline.com? How to Book Tirumala Special Entry Darshan (Rs.300/-) tickets in ttdsevaonline.com? How to apply for Tirumala / TTD Seva Electronic DIP Online Lottery System in ttdsevaonline.com? TTD Seva Electronic DIP Result (Tirumala Seva Lucky DIP Results) in ttdsevaonline.com? Cottage Donor Management System in cdms.ttdsevaonline.com website? If you are planning to visit the Tirupati temple, it is best that you prepare for your visit in advance. As there is a high influx of devotees in the temple each day, it is difficult to get a quick turn for the darshan or to get cheap/good accommodation nearby. For giving the pilgrims a pleasurable experience, the government of Andhra Pradesh has started a new portal as ‘ttdsevaonline.com’. It is an attempt by the Tirumala Tirupati Devasthanams Trust to give better user experience for all the services to all the devotees. Ttdsevaonline website is being regulated by the Tirumala Tirupati Devasthanams Board only. Booking of Hotel, Guest House, and Temple cottages etc. in both Tirupati and Tirumala. Booking of special publications or subscriptions. In any browser of your choice type ttdsevaonline.com in the address bar. Now you will be able to see the homepage of the ttdsevaonline.com portal. On the home page, search for the ‘Signup’ button and click on it. You will find it near the main Login tab. When you do that, you will be taken to a new page of User Registration. There you will be asked if you are an institution or Individual. Make a choice as per your requirement. Here, I am explaining the process of Signup as an individual. When you opt for ‘Individual’ SignUp, you will be asked to enter your personal details. All the details asked are necessary to be mentioned for the registration. You need to enter the following details: Your Name, Mobile Number, Date of Birth, Gender, Address, Photo ID proof and its number & Username for the portal registration and the password. It is necessary for you to carry the photo ID proof that you have mentioned on the portal. So mention the details of only that photo ID proof which you possess and can carry with you while visiting the temple. Make sure to carry that proof with you, if you do not want to face any problem there. After entering the desired details, click on the Continue button to accept the ‘Terms and Conditions’. In the next page that appears after clicking on the continue button, you need to enter your email ID and verify the same with the email received from TTD. You also need to verify the mobile number that you have mentioned in the form. For verifying the mobile number, you need to enter the activation code that you receive in an SMS by TTD. Once the mobile number is verified, your registration process is over. You are now successfully registered. To check if the registration is being done successfully, try to Login with the username and password that you have marked in the application while registering. TTD board has constructed many complexes, guest houses etc. which has about 1500 guest rooms in total. All the guest rooms are available for public use. Most of the people ask about how to get access to these rooms. Well, the access of Tirumala rooms online booking (Accommodation) as well as on the spot booking. But it all depends on the availability at the time of your visit. 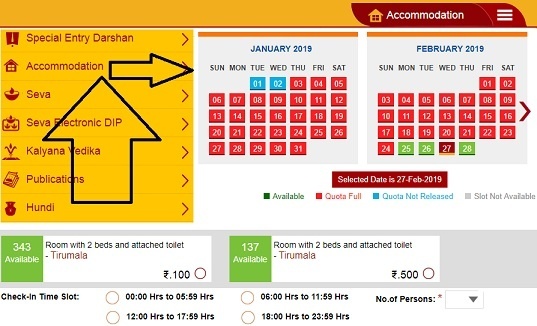 If you want to book a room for you or check the availability of the room at a particular date of your visit, you must visit the site the official web portal of the Tirumala Tirupati Devasthanams (TTDSEVAONLINE). Login to the site with your credentials. If you are not registered on the site, you need to make a registration of yourself on the site. The process of registration has been discussed in detail above. Follow the above guidelines for registration at the site, if you have not already registered on the site. If you are registered, Login on the TTD website with your credentials. Once you are on the homepage, you will be able to see the accommodation link on the dashboard. The accommodation link is visible under the services section. Click the link. After clicking the link, you will be asked to enter certain information. The information asked is: Select the location, Select the date, Select the number of accompanied people, Select the room which you want. You have to choose from different types of room. Different types of rooms cost differently, and you will get a clear indication of it on the page. Choose the room according to your budget and comfort. You can book a room for as low as Rs. 50 and as high as Rs. 2500 and Select the Check-In time slot. Note: The booking starts only 60 days prior to your visit. The green box in the window indicates that the rooms are available. The blue box indicates the quota which is not released and the red box shows that the quota is full. After you have entered all the details carefully, click on the continue tab placed at the bottom of the page. On the new-directed page, you have to give the information about the primary Pilgrim. Primary pilgrim means the person whose detail of ID proof is entered on the portal. He/she has to carry the ID proof essentially to get access to the booked room. The details asked about the primary pilgrim are: Name, Mobile Number, Age, Gender, Email Address, Photo ID Proof and Photo ID card No. 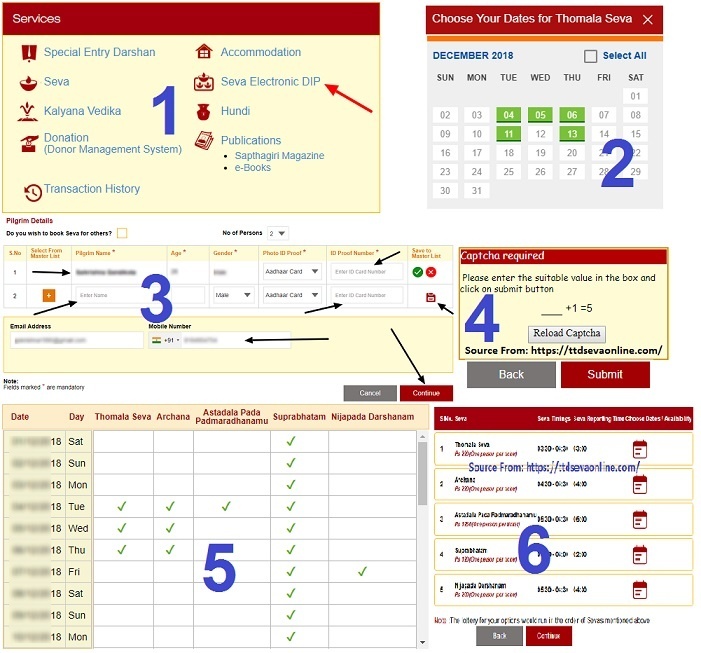 Note: Meanwhile, if you have changed your mind about the Check-In Time, Location or Type of Accommodation, you can change it, by clicking the ‘Change Details’ icon placed on the upper hand right-hand corner of the page. After entering all the desired information correctly, click on the Continue button. Now, on the page that appears next, you have to enter the information about the payment mode you want to choose. You can choose to pay from a Credit card, debit card or internet banking. After choosing the most suitable payment method, click on the ‘Pay Now’ tab placed on the right hand lower corner of the page. Once you have made the payment, you get a confirmation of the same. Now, you are done with the online booking of the room at TTD website. Take a print out of the booking, if you want to be on the safer side. Though you can get an access to the booking ticket by browsing the booking history if however, you lose your username or password etc. The printed ticket will help you in your journey. To add to the ease and comfort of the pilgrims, the TTD board has introduced Tirumala Special Entry Darshan 300rs tickets. The service had been started on 21st September 2009. Special Entry Darshan tickets are also called in the local language as Seeghra Darshanam tickets. The booking of these tickets is open all the time. The cost of the ticket is fixed to Rs. 300 per person. With a ticket, one gets an added advantage of getting two Prasad Laddus for free. e-Darshan counters and Indian Post Offices make a current booking of the Special Entry Darshan Tickets. For this, a person has to pay some extra service charge. If you are willing to pay the service charge you can visit any Indian Post Office, Telangana Mee-Seva Centers, Kalayna Mandapams (by TTD). Remember, while visiting these centers for booking, you will need to carry your ID proof or Aadhaar card. Reprinting of the tickets is not available in the current booking but is available for online booking. Here, I am defining the process of how to make an advance booking of the TTD Special Entry Darshan Ticket through internet booking. Login to the TTD site with the username and password you have already generated following the above-mentioned directions. In the services section, you will see the tab ‘Special Entry Darshan’. Click on that link. 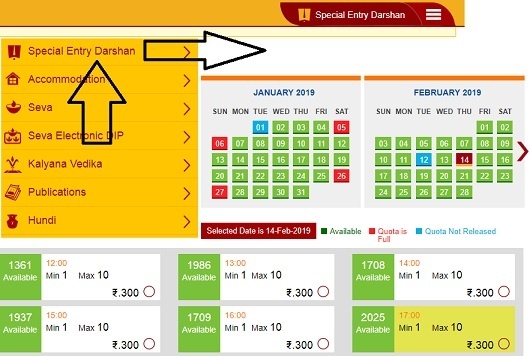 In the page which appears next, first, you have to choose the date for which you need the ‘Special Entry Darshan’ ticket. You will get to see the calendar for four months. You can choose any date of your choice. Together with the date, you need to choose the number of persons for which you need the tickets. One cannot get tickets for more than 10 persons. After selecting the date for which you need the ticket, you have to select the time slot of the day for which you need the tickets. The screen will clearly highlight the available slots on the screen. Ticket slots are available from 9 AM in the morning to 6 PM in the evening. Click the checkbox in front of the slot which you want to book the ticket for. Note: If you want more laddus, you can book them also. Only two more laddus for each person can be booked at a cost of Rs.25/- for each laddu. If you want to make an offering to the temple Hundi, you can choose it also and the amount to be donated. However, the offering is completely optional. Now choose, if you are making a booking for the self or the others. After making the choice, click on the ‘Continue’ tab. Now, just fill in the details of the pilgrims after selecting the slot. If at any time you feel that you need to change the details you have filled before, you can change it by clicking the ‘change details’ icon placed on the top right-hand side of the page. Now, fill in the detail of all the pilgrims for which you need the Special Entry Darshan ticket. You need to enter the name, gender, age, photo ID proof and the associated number of the proof. After filling in the details of pilgrims, write down your email address and mobile number. However, it is optional. Now, click on the ‘Continue’ tab at the bottom of the page. This is the last page, where you need to make the payment. Choose the option of payment which suits you best: Net banking, debit card or credit card. Proceed to make the payment. Once the payment is done, you will get the E-receipt of the same which can be downloaded and printed. Note: There is a special provision or option for the people who choose the morning time slot of 10 AM and 11 AM, or evening slot 5 PM or 6 PM. The facility that they get is that they can choose to nook a 12-hour guest house, if they wish, in Nandakam. The price of the guest room is Rs.350/-. The following are the List of Tirumala Seva names, Seva Cost and Timings are as mentioned below…. If you have planned to visit Tirupati and you have researched well about how pooja is conducted there, you must have learned that the God at Tirupati is offered various kinds of Sevas: Kalyanotsavam, Vasantotsavam, Unjal Seva, Dolotsvam, Arjitha Bramhotsavam, and Sahasradeepalankarana. The booking for the sevas can be made online. Previously, there was only one way for the booking i.e. monthly distribution. But now, booking can also be made with the help of Electronic Dips System. Now, choose the date for which you want to book seva. The dates on which the sevas are available to be booked are shown in green. When you make the selection, a list of tickets is shown. All the available tickets on that day are shown in the list. Choose the seva as per your choice. 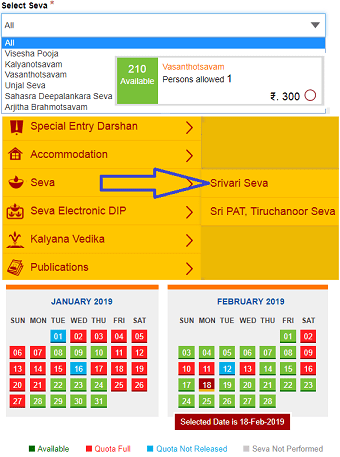 For e.g., if you want to choose either Kalyanotsavam or Kalyanam or Arjitha Seva or Suprabhata Seva or Thomala Seva ticket, select it. Note: Remember, for Kalyanotsavam, only one ticket is allowed and this is a couple ticket. But, for other sevas two tickets are allowed. After choosing the type of seva, you need to enter the details of the pilgrim. Again the details demanded are the same as discussed above. You need to enter the name, age, gender, photo ID proof and the number of the same, mobile number and email ID. After filling in all the details, you need to make the payments. Make the payment as per your ease. Once you have made the payment, you will get the alert of the same on your mobile and email. Download the ticket and save it to use later. Do you know the fee charged for booking different seva’s? Well, the maximum fee is charged for Kalyanotsavam Seva. The fee for it is Rs.1000/- for the couple. For Sahasra Deepalankarana and Vasantotsavam, it is Rs.300/-, and for Arjitha Bramhotsavam and UnjalSeva or Dolotosavam it is Rs.200/- for each person. As lots of people make a booking for this series, as of now, 4 months of advance booking is made. Getting an access to some Seva is a wish and desire of many. But in the past, getting a Seva ticket was very hard. A strong recommendation or contact was the only way to get access to seva. But now the system has been made easy. Now there is an Tirumala Seva Electronic Lucky Dip Lottery System to get the TTD seva tickets. The process is a bit tricky, but one must try his/her luck to get the seva ticket at least for once. To be eligible for the Seva Electronic Lucky Dip Lottery, you need to book the TTD Darshan tickets from the official TTD site. For this, you will have to register your account there and purchase the ticket. The process for doing this has already been discussed above. Please follow the process to register yourself. After Logging In and making the purchase of the darshan ticket, you will be able to see a link ‘Seva Electronic Dip’ in the services section. Click on that link. On the new page which appears, there are some directions and instructions to which you need to agree by ticking the checkbox ‘I have read and agree to the instructions’. Now click on the continue button after that. On the next screen, you will have to select the name of the person for which you want the Seva ticket. One can only select one or two people and not more than that. You have the choice to select the person from the master list as well. Once you have made the choice, click on the ‘Continue’ button. Now, you will be taken to a page where you will get a list of different kinds of seva. You have to choose from amongst them. Choose the seva for which you want to apply. The fee to get an access to the seva is also indicated with the name of the seva. You will also be able to see the seva timings and seva reporting time. If you want to get access to different kinds of seva on different days, you can choose the dates and check the availability on that day. When you select an individual seva, a calendar pop-ups showing you the availability. Choose the date of your choice to make a booking. There are different kinds of seva to choose from, like: Thomala Seva, AshtadalPada Padmaradhanamu, Nijapada Darshanam, Archana and Suprabhatam. A person has the freedom to choose all the Seva’s if he / she wishes to. Some seva’s are available all the days, but some special seva’s are available on some special days only. So choose accordingly. After choosing the seva, click on ‘Continue’ tab. On the next page, you get a summary of the selections you have made for the seva. After checking in all the details, click on the ‘Submit’ tab. If you do not get the confirmation message for some reason, you can check in the transaction history as well. You will also get an information about how many days are left for the electronic lucky dip. If you have registered your mail ID with the site, you will get an e-mail confirmation of the same with all the details. Nothing is in your hands now. If you get selected, you will get the confirmation and information of the same on your e-mail, or else you will not get any message at all. If you are selected for any of the seva, you will have to pay the amount for the seva after the confirmation through an online payment system. Actually, the Seva Electronic Dip is made on only one day in a week and i.e. only on Tuesday at 12:00 PM. Once the Electronic dip process is over, all the selected persons get emails or SMS within an hour of selection. Remember, to book for the seva, one needs to make a payment for the seva within 24 hours of receiving the confirmation. If you do not get the confirmation of the seva, or if you are unable to check the mail or SMS, you can check the TTD Seva Electronic DIP Result whether you are selected for any of the sevas by logging in to the TTD Seva Online portal. The Tirumala Seva Electronic DIP Results if you are selected in the Seva Lucky DIP Result, whenever you log in to the portal, you will get a prompt message congratulating you for the selection. It will also display the name and date of the seva for which you are selected. It will also request you to make the payment for the seva. If you want to make a quick payment for the seva, click on the ‘Pay Now’. If you want to make the payment later, you can click on the ‘X’ on the right-hand side upper corner of the prompt window. Once you have made the payment, you will get a seva ticket receipt, which can be downloaded to be printed. A copy of it can be accessed anytime from the transaction history page. Whenever you wish to make the payment, you can access the transaction history page to make the payment. You can make the payment either through debit card, credit card or net banking. The seva ticket receipt contains the Booking No. and all the information about the pilgrim who enrolled for the seva. There is some important information relating to the visit. One must read them carefully. Whenever we visit a temple we tend to make a donation for the Nobel cause. If you want to make a donation at the temple, you can make a direct donation in the Hundi’s that are located at the temple. If one wishes to make the payment online and want to make the payment for a particular cause, one can do so very easily. The process is very simple. The name of the trusts makes you clear about the purpose for which they serve. You can make a donation for any of these trusts. The donations from Re. 1 to Rs. 999 are tax-free and one does not get any receipt of the same. From Rs. 1000 to Rs. 1,00,000 there is the tax deduction and one gets the certificate of the same from the TTD Trust. There are various privileges given to those who make a donation above Rs. 1 lakh. Let me quickly give a glimpse of that. 3 days VIP darshan of L2 listed sevas. L1 VIP Darshan Tickets for 3 days. Actually, the board has directed that if you wish to donate a big amount in name of the trust, you have to make the donation by way of cheque/demand draft/ International Money Order in the name of the trust for which you want to make the donation. For e.g., if you want to make a donation to Sri Venkateswara Anna Prasadam Trust, you have to make the demand draft as The Executive Officer, Sri Venkateswara Anna Prasadam Trust, TTD, Tirupati. Once your donation is acknowledged by the TTD board. They will send you an acknowledgment letter and a passbook. You will need to send two PP size photographs to get the passbook. It is necessary for you to carry the passbook every time you visit the Tirupati temple. You can get all the benefits attached to the donation scheme, only if you carry your passbook with you. Tirumala Tirupati Devasthanams Board has also revamped the management system at TTD. TTD has digitalized the entire cottage donor system. The website of TTD CDMS is https://cdms.ttdsevaonline.com. Are you aware of who is Cottage donor? Actually, those who have donated more than rupee 1 lakh for the construction or improvement of the infrastructure of the cottages are known by the name cottage donors. As the donors requested a transparent system to see how their money is utilized, the TTD has developed a digital Cottage Donor Management System (CDMS). In this system, the officer created a TTD User login of all those who have contributed to the Cottage. For this, the officer takes the mobile number and email from the account of the registered donor. For verification, the officer sends a self-declaration form. Once, the donor is verified, the board shares the detail of the user credentials with the donor. To book the accommodation, the donor has to Login with the credentials shared by the officers’ in-charge of the CDMS. Once they donors login at cdms.ttdsevaonline.com, they get access to the Self Service portal. On the home screen, rooms as per the donation scheme are automatically indicated. Check for the availability of the desired room and book the room for self or for the others. You have to re-enter the identification details there. Once you do that, you get a booking receipt. Take this copy with you and show it at the CRO Online Room Reservation Office to get the room.